Located on the south side of the St. Lawrence, the Gaspé Peninsula, with its rugged but breathtaking landform, is the continuation of the Appalachian Mountain range where they plunge into the sea. The Gaspé Peninsula in Québec, Canada encompasses many parks and reserves, and its forests, beaches, cliffs and meadows form an immense sanctuary for fauna and flora. It is a true Garden of Eden, where one can absorb the natural beauty of the environment. With so many various ethnic groups creating Gaspé, you will find a wonderful mix of traditions, cultures, culinary delights and colorful accents. See why it was called Gespeg meaning the place where the land ends. Sit back and relax as New England scenery leads us to our lodging for the evening in South Portland, Maine. This morning's route will take us through Augusta and Bangor, Maine and on to New Brunswick. Our lodging this evening will be at the Best Western Fredericton Hotel in Fredericton, New Brunswick. Before departing on the last part of our journey to Gaspé we will visit King's Landing Historical Settlement, a living museum dedicated to New Brunswick's past and depicting a fascinating lifestyle typical over 100 years ago. Lunch is included at the King's Head Inn. After departing Fredericton, we will visit the world's longest covered bridge near Hartland, New Brunswick. Our lodging this evening will be in Carleton on the Gaspé Peninsula. Our tour of the Gaspé Peninsula continues as we ride through small fishing villages and along lovely beaches to a breathtaking view of the village of Percé for our overnight. After lunch we will visit the Percé Wildlife Center to learn about the interaction of land and sea through films, slides, wildlife and floral displays. The remainder of the day is free to explore the delightful village of Percé. Dinner this evening will be at our hotel. After breakfast, we will cruise to St. Bonaventure Island to view the natural bird sanctuary which is home to more than 70,000 sea fowl. After lunch in the quaint village of Gaspé we will visit The Musee-De La Gaspe, a museum dedicated to the culture of the Gaspesian people. Our lodging this evening will be in Riviere-Madeleine. After dinner, be sure to stroll along the shore of the St. Lawrence River collecting pebbles and watching the freighters sail by. 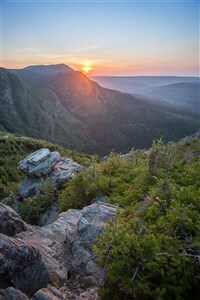 Our morning sights are breathtaking as we travel the Northern Gaspé Coast to less rugged countryside and then on to Park Metis and its beautiful English Gardens. We will travel to Riviere-du Loup to our overnight lodging. A highlight of our tour will be shopping in St. Jean-Port Joli, known as the wood-carving capital of Quebec. Our destination today is Quebec City where we will have lunch at the romantic Chateau La Frontenac, a guided tour, plus free time to explore this truly European City. A morning departure from Quebec City will bring us to Burlington, VT in time to freshen up for an evening dinner cruise on Lake Champlain. An early start will bring us home by late afternoon. A passport is required for ALL travel between the U.S. and Canada. If you are bringing children on the tour other than your own, customs is requiring that you have a registered letter of approval from their parents.